This collage in process was hurriedly glued together on the eve of a force 5 hurricane approaching the Virgin Islands. As Hurricane Georges came to St. John, it slowed down to force 3 and speeded up again as it went by, causing much damage in the Gulf of Mexico. 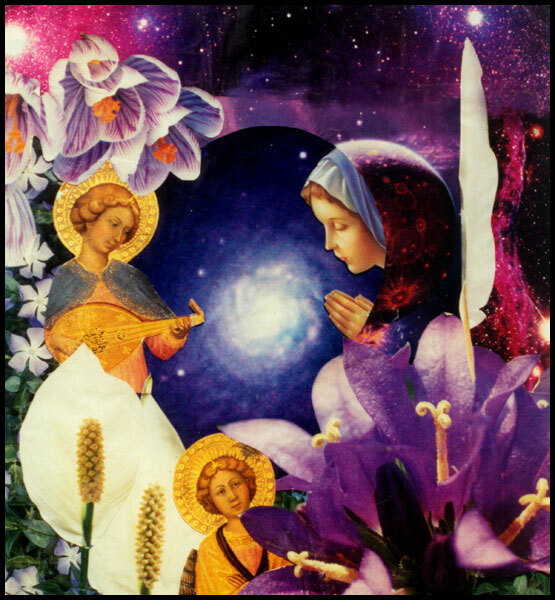 Divine Mother Mary or Eve, Queen of Heaven, helmeted as a Moon goddess by the Moon’s cratered crust, prays in front of a pinwheel galaxy. Behind her, along side of the Veil nebula, rises the white Feather of Truth worn in the headband of Egyptian Maat, goddess of wisdom. Mary is attended by angelic musicians. Several species of purple flowers add to the color of sanctity. Crocuses pour forth from the bright star, Antares, at the heart of the Scorpion, with its close-by nebula, IC 4606.